Getting urgent care in West Hollywood or even throughout all of Greater Los Angeles can be a hassle, especially if you need to submit yourself to the possible infections in a packed ER waiting room. West Hollywood residents who would like a more convenient alternative will be delighted to know that a house call doctor can come to them instead of the other way around. Doctors making house calls do indeed exist in the modern day, and Dr. Michael Farzam is one of the best. 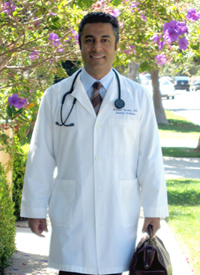 He is the CEO and head doctor of House Call Doctor Los Angeles, providing top urgent care in West Hollywood. Unless you have a condition that necessitates a 911 call, Dr. Farzam almost certainly can tend to your every medical need. Urgent care West Hollywood can expect from Dr. Farzam treats includes traumatic injury care, as well as the ordinary acute illness care and tending to chronic disease flare ups. Even routine healthcare quandaries such as executive physicals or drawing blood for testing are something that Dr. Farzam does during house calls. Dr. Farzam is proud to provide urgent care West Hollywood can count on. If you are in need medical house calls, simply call House Call Doctor LA for further information, including pricing quotes, fee schedules and more. Dr. Farzam will arrive at your location usually within an hour or less of you making a phone call. Why wait in the health clinic in Los Angeles, when Dr. Farzam can attend to your needs at your own home! Call 310-849-7991 today for further information.